Athletic Bilbao coming to Boise? File this in the simply awesome category! The Basque Studies Foundation, in Boise, is trying to bring Athletic Bilbao to play a friendly against a Major League Soccer team! 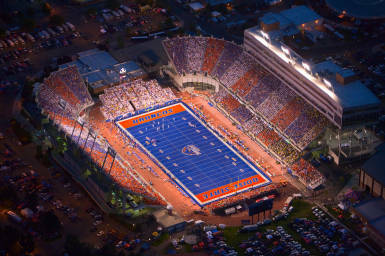 This is going to be in the stadium on the Boise State campus (you know the one, the one with the blue field). They are still working out details, but Athletic Bilbao will likely play either the Seattle, Portland or Salt Lake team. Argia Beristain, who was part of the Seattle club back when I lived there, is the game’s organizer. You can find out a little more in this Idaho Statesman article. I’ve only seen one professional soccer game. The Colorado Rapids had a Basque appreciation night when they brought over a play from Athletic Bilbao, Aitor Karanka. It was pretty cool. Though the crowd was small, especially for such a large stadium, it was still full of energy. I’m excited to see my second professional game, even if it is a friendly. Great job, BSF and Argia!